The March Motor Trend has an article on four cars that challenge the M-B "S" Class. I know this is "E" Class forum, but still interesting. They compared BMW 7, Lexus LS, Lincoln Continental and Genesis G90 and used the top models in each. G90 won. The implication for M-B is that MT promises a comparison later between G90 and M-B "S" Of course M-B "S" ranges in price from $80,000 to almost $200,000. Many of the factors in play are applicable to all M-B vehicles: cost to own; safety features without expensive options; reliability; actual ride comfort; features; infotainment systems; etc. It was a good article and fairly fair comparison. What are sales figures. S class vs Hyundai? It's Genesis, not Hyundai. Genesis is the new luxury division of Hyundai Corp. Currently offer three models with more to come. Sort of how Acura, Lexus and Infiniti began. As for sales figures, pretty small for Genesis right now naturally. Just as they were very small for Lexus when it debuted. The Motor Trend comparisons are on comparing the cars. I know this is "E" Class forum, but still interesting. yes and no....yes it's an E class forum, and no it's not at all interesting..besides you've already posted this exact same thing on the S class forum...I think you've got your Hyundai messaging on a Mercedes forum covered. Bingo. and if no one is buying the Hyundai Genesis who cares what it does against the S class. As expected, some do not like information which is not totally positive about M-B. While it may be about the "S" Class, it IS interesting because of how it may effect M-B vehicles across the line. People didn't think much of Lexus when it first came out either and it became the best selling selling luxury car in America for decades. As recently as 2015 it outsold M-B in America and M-B has far more models. After all, a lot of what DAG/M-B does is in reaction to what other makes do. Examples: Lexus, BMW, Audi. I posted it to the "S" Class thread after I posted it here as it may be of more interest there. While you many read both E and S forums, some members may not. It IS NOT a Hyundai, anymore than a Cadillac is a Chevrolet or an M-B is a smart or a Lexus is a Toyota. While Genesis is still basing some of its architecture on former Hyundai vehicles, so do other companies. The implication is for what it may do in the future - and you better believe the people in Atlanta and Stuttgart are interested. Last edited by El Cid; 01-30-2018 at 01:41 PM. So, I don't like the S class. If I'm going to shell out another 30K beyond the cost of an E class, it better fit me (or fit 4 guys my size when we go play golf). I'd say bring back the W126 body. ^^ I am 6' 2", and I don't know how I will fit in the back of a new S Class, but my W126 SEL definitely has enough room in the back! These discussions would be great on a Hyundai/Genesis forum so they could validate their purchases but I don't come here to read about some other car. This is specifically a W212 E-Class forum, not the old C-Class forum, not the new AMG GT forum, not even the other W211, W210, or W213 E-Class forums. I made my choice. I come here to talk about my interest in this specific vehicle type. I don't give a rats *** about a rebadged Hyundai. Take it to the General Mercedes Discussion forum or not at all. Apparently you are bouncing back and forth more than I am. And the two threads are not exact. I am free to post it wherever I wish or are you now the Forum Police? I posted it to the W212 thread because that is where I post most things. Many, many people post general things to model specific forums. It is not a "rebadged Hyundai." It is the first offering of a NEW make and substantially changed. Which is exactly why MT ranked it above Lexus, BMW and Lincoln. THEY consider it a challenge to S Class or they would not have included it in the comparison. They excluded Cadillac because they did not consider it a serious challenge. If you don't want to read the thread, don't. Don't respond if you don't approve of the thread. Incidentally, US S Class sales have been falling since 2014 - about 25,000 sold in '14 and 15,888 in '17. Genesis sold 4,398 in '17 which was essentially the first year for a totally new make and model with a limited number of dealerships. For information, Genesis sold 16,214 G80's in 2017. You can be sure the people in Stuttgart and Atlanta care about what Genesis is doing. Y'all's prejudice and defensiveness over owning an M-B is showing. Last edited by El Cid; 01-30-2018 at 10:19 PM. I ditto suggestion that this belongs in General Section. On left side of each reply you will also find red dot marked "report post". Don't expect much as that would force moderator to get off Playstation joysticks. I currently own two Mercedes and recently traded in my 2011 Hyundai Genesis 4.6 V8 on a Toyota Highlander Limited Plat.. My wife and I drove the Genesis for over 210,000 miles and it was the most reliable car we have ever owned. Never a break down, no oil use, original brakes lasted to over 134,000 miles, No electronic problems, The Genesis transmission was always super smooth. I do have to say that Mercedes has been a better riding car and better handling but now it seems that the Genesis may be catching up to Mercedes on ride. Per your earlier post, your post should not be here. Besides, what does "rank" mean? Also, this is a link to the C&D Car Buying service, not actual reviews or comparisons of the cars. No information as to how ranks were determined. Last edited by El Cid; 01-31-2018 at 09:53 AM. So you are saying there is no bias then with the MT review? You know all auto magazine reviews and ranks are biased, right? Hyundai is not a W212, and this discussion needs to be moved. Cid, Buy one already..this Hyundai love affair of yours has been going on long enough...pull the trigger man and discover what a true luxury sedan should be!! Guess you are just too dumb. It is not a Hyundai - it is a Genesis. Get over your prejudice. Aha, maybe because it is not made in Germany by Aryans? If it needs to be moved, the moderators would have moved it. Y'all's posts really show your bias towards and hatred for anyone who dares challenge your absolute fealty to the god you have made. I was merely trying to share information that is relevant to the M-B make, whether it is a C, E or S or any other model. While I have mentioned Hyundai and/or Genesis in the past, it has been a pretty good while. Regardless, it is information that you can accept or ignore. Your choice. If you carefully and intelligently re-read my initial post you should see that I never said the G90 was better or even as good as the S Class. Only that MT ranked it number one of the four cars it compared and noted that they would later compare it to the S. As noted S sales are declining and more competition may have an impact on future sales. This may in turn have some effect on E Class sales. If you do not like the thread or my comments, IGNORE ME. Thank you. Personally I want MB to be challenged by other manufacturers and could care less if it is Audi, Hyundia/Genesis, Lexus, etc. The more features and improvements that lesser expensive cars incorporate puts more pressure on the luxury brands. We all win in the end. Guess this is exactly the point I was trying to make by starting this thread. There is no Lexus without Toyota, there is no Acura without Honda, there is no Infiniti without Nissan, there is no Lincoln without Ford and surely there is no Genesis without Huyndai. I do not understand how you can even entertain the idea that Genesis is its own car brand. It is a Huyndai built car no matter what they call it just like the others mentioned are built by their mother company. Looking at some other car brands like Skoda, Audi, Lamborghini, Seat and Volkswagen they are all owned by Volkswagen but they all originally were independent different cars and as such have their own design etc. departments. I'm sure lots of integration has happened between these makes but still it is different than calling a Genesis its own brand when it surely is not. What comes to S-Class vs. Huyndai Genesis I just don't know how the results could be as you say it is and I don't stand against it. The car testers must have a whole different idea of what to respect in a car than what I have. And it really is good for us consumers as it will bring these very expensive car prices down. Genesis needs to earn the right to be considered its own luxury brand. It wasnt even its own brand until a few years ago. Before that it was still a Hyundai. It doesnt matter what they market themselves as. They have to prove their concept. Part of proving their concept is for people to take them seriously as a luxury brand, which means increasing their Brand Value. Much in the same way Lexus, Infiniti, Audi did. None of those 3 companies had brand valuation anywhere close to where they are now, irregardless of how well priced or equipped they were. Because people do not buy Luxury cars for value. Value is an afterthought. It comes secondary. Number 1 priority is was and always has and will be prestige and image. Genesis is still Hyundai until they can prove they are not Hyundai by changing peoples minds. Car and Driver is just as credible as Motor Trend. 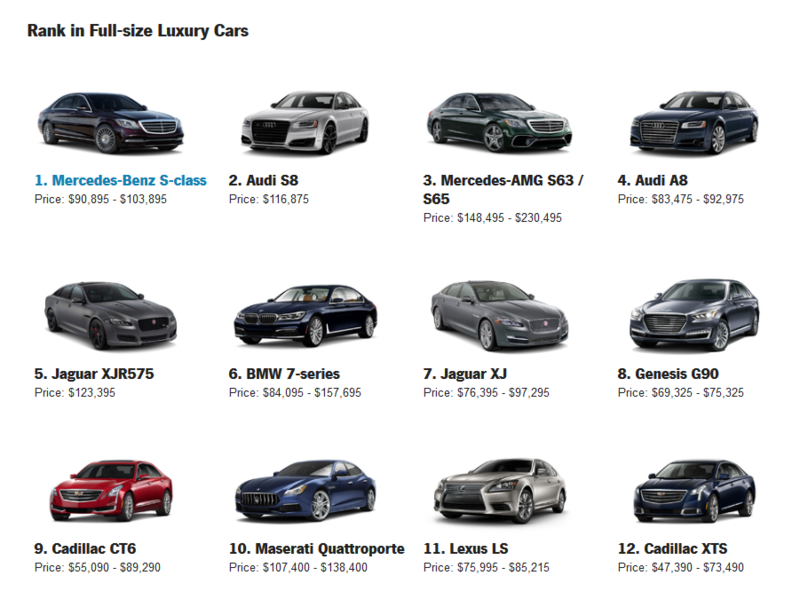 They rank the vehicles much in the same way as motor trend. Subjectively.